This is the harrowing and extraordinary story of the camp at Belzec. Unlike Auschwitz, Belzec is not a name we will all recognise but 600,000 Jews perished there. One man Rudolf Reder escaped and gave an account of the camp. Mark Forstater has traced it down and it is the centrepiece of his book, a remarkable odyssey into a truly dark death machine. Reder's story is horrifying. His testimony, the horror of what inmates suffered, and how he managed to survive and escape is an important addition to Holocaust literature. Forstater has produced over 30 films including the classic Monty Python and the Holy Grail and is also a serious author. His books include The Spiritual Teachings of Marcus Aurelius, The Spiritual Teachings of the Tao, the Spiritual Teachings of Seneca and The Living Wisdom of Socrates. This book is in three parts. Part One: A Perfect Killing Machine -- a short introduction to the witness statement of Rudolf Reder, who was the only post war survivor of the Nazi death camp at Belzec. 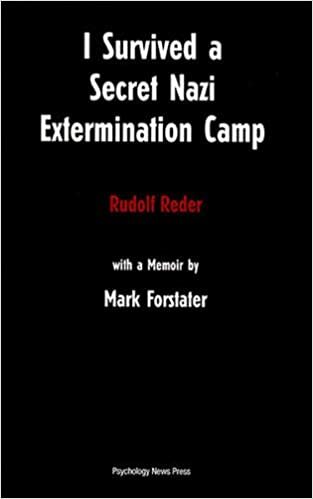 The introduction gives some biographical information about Reder and some essential background on the Nazi death camps.He escaped because he was driven to Lvov to get some spare parts for the gas chambers. His Nazi guards went on a drinking spree. Part Two is the actual witness statement made by Reder in 1946 to the Jewish Historical Commission. Part Three: Discovering Jewish Atlantis -- is a personal memoir by Mark Forstater.